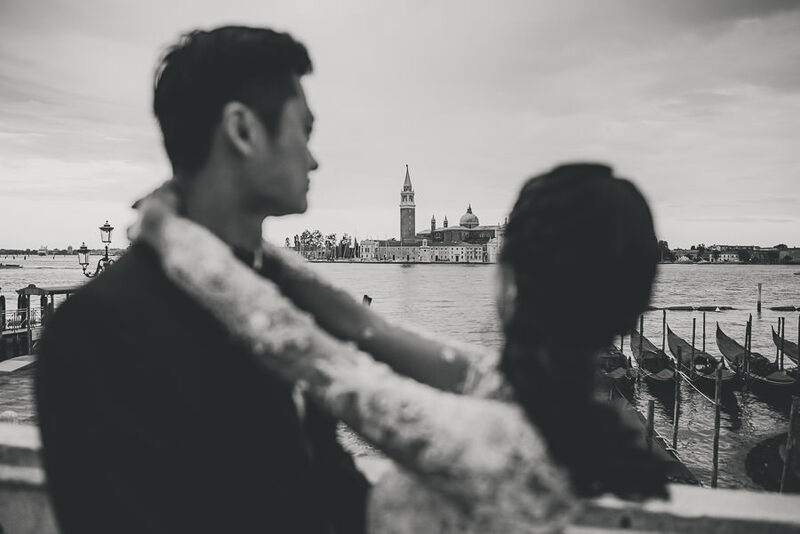 I came to the opportunity to shoot this romantic pre-wedding photography session in Venice just by chance, as many beautiful thing happen in life. 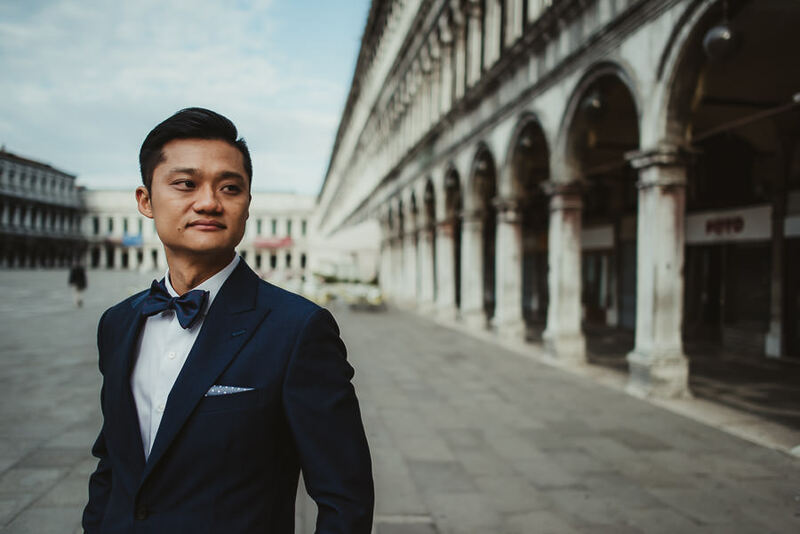 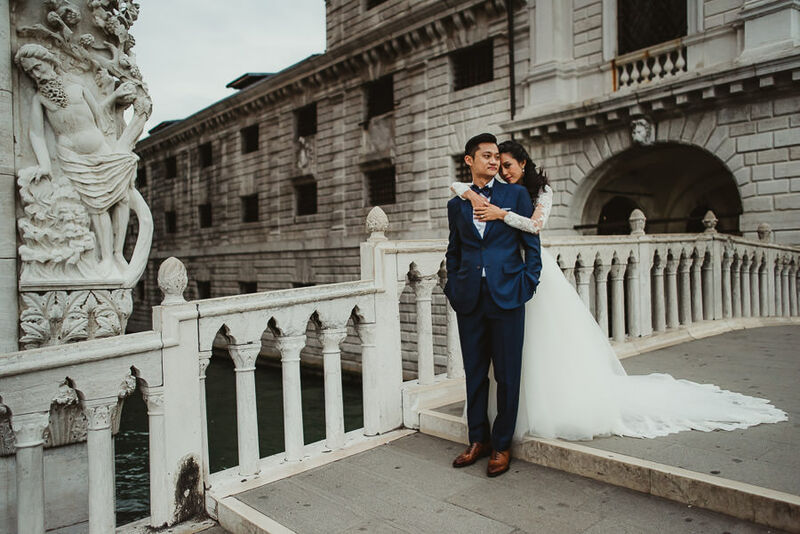 I met Jiaxi & Wee in Florence, where I shot their first pre-wedding session few weeks ago; starting from the beginning they decided to hire me also for for a second photographic session in Cinque Terre. 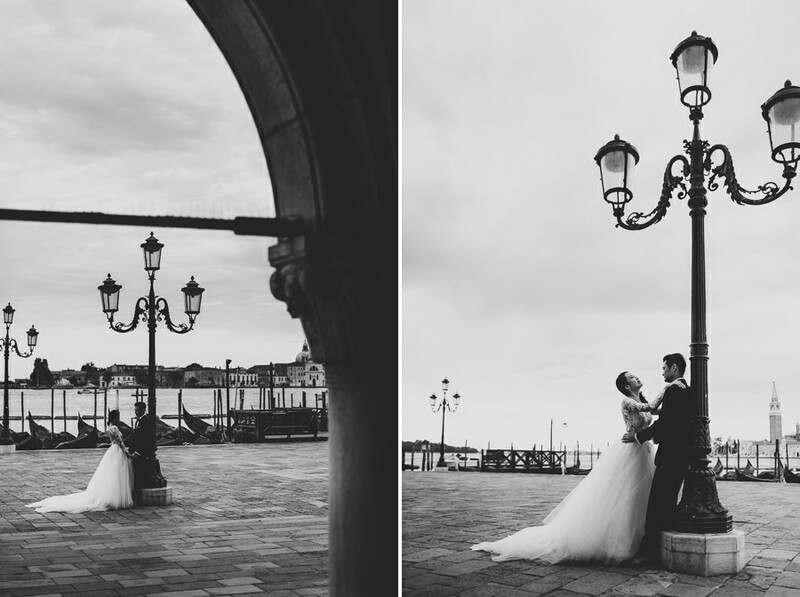 But at the end instead of searching for a local Venice Wedding Photographer to shoot third and last part of their Italian pre-wedding photos, they asked me to follow them there, too. 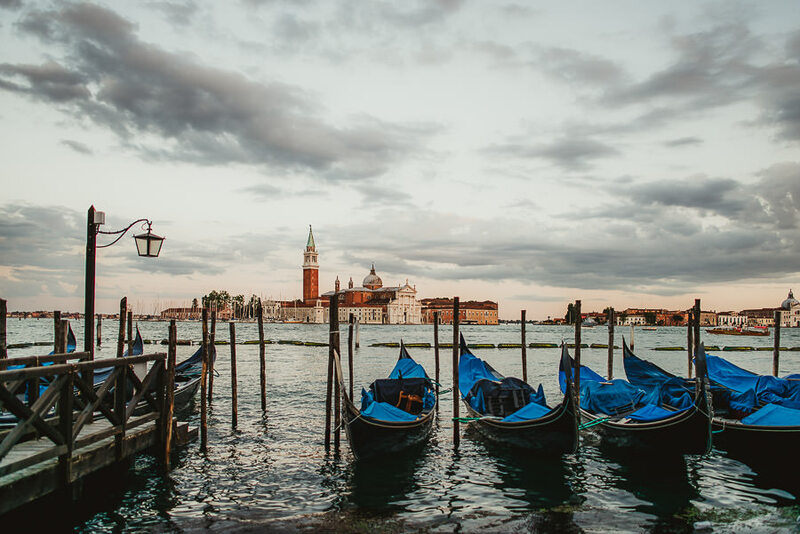 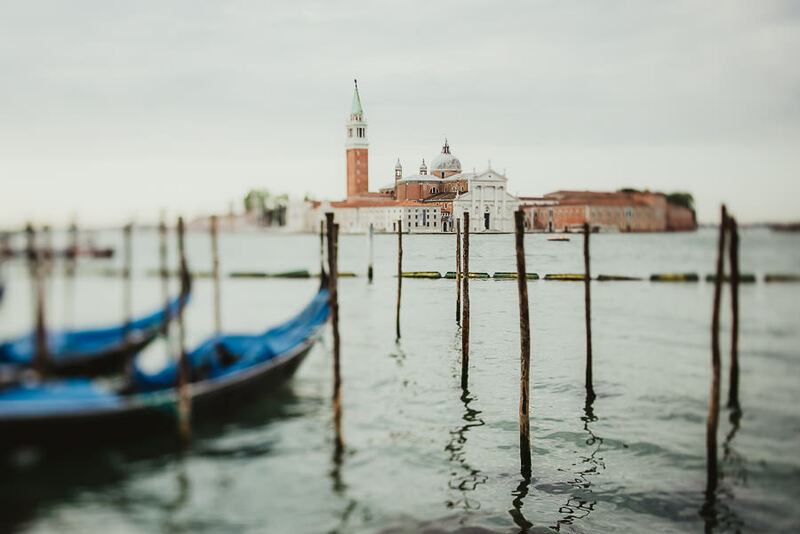 I never went in Venice before in all my life; I know it may sound crazy, because I really love to travel and Venice is just one hour and half far from Florence (the city where I’m based and live) by train. 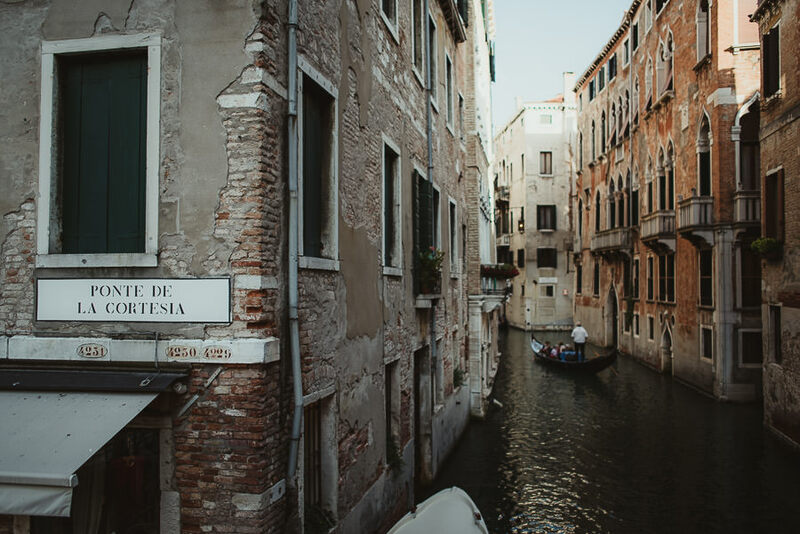 So, since I never have been there before, I decided to leave one day in advance to get a full day just for me to explore Venice, probably like a normal tourist would do. 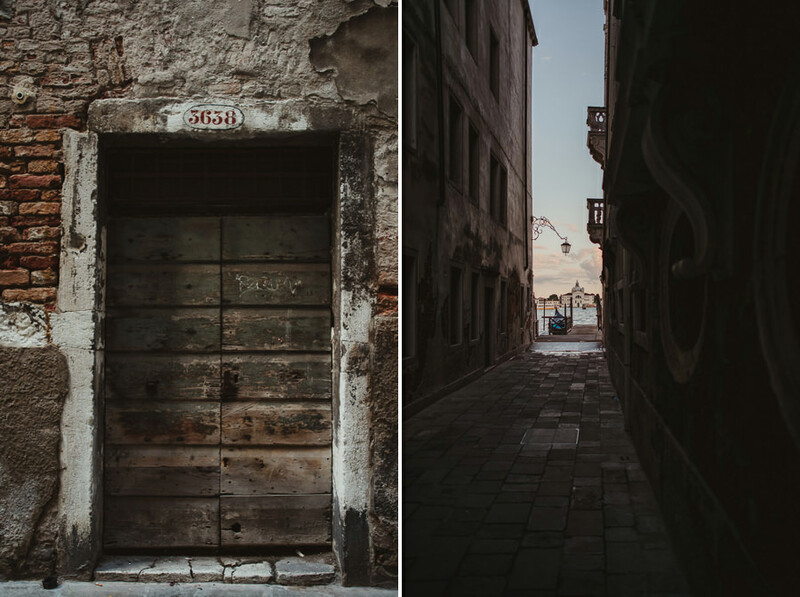 I took with me my favorite compact camera and I spent the whole day getting lost in the small streets, across the billions of canals and waterways you can find in this strange beautiful city. 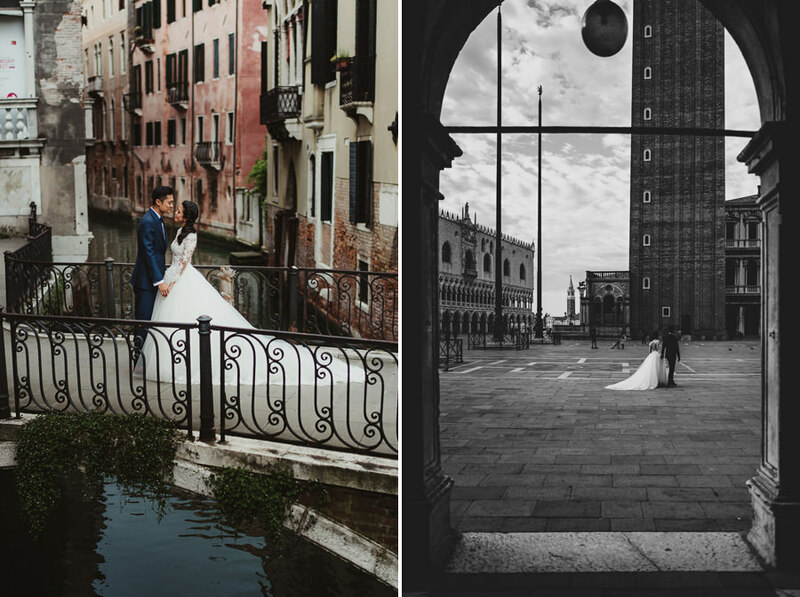 I’d have loved to see the famous phenomenon of high water in St Mark’s Square, but sorry Fra, not this time! 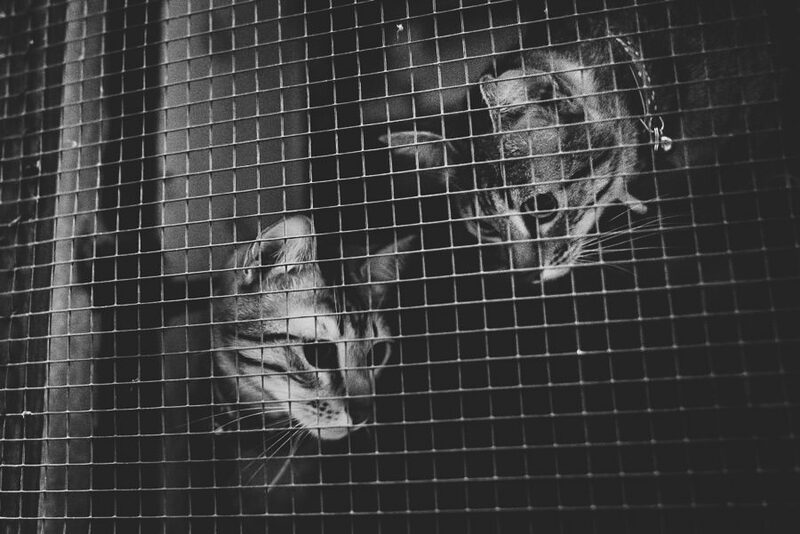 The following day was THE day, and I asked them to wake up really early in the morning (5:30am!! ) 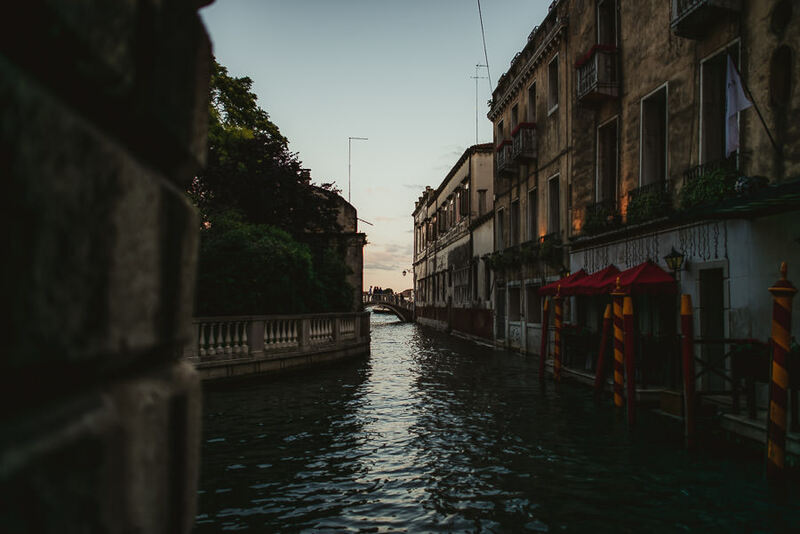 to have the first sunbeams just for us, walking through an unreal, desert Venice. 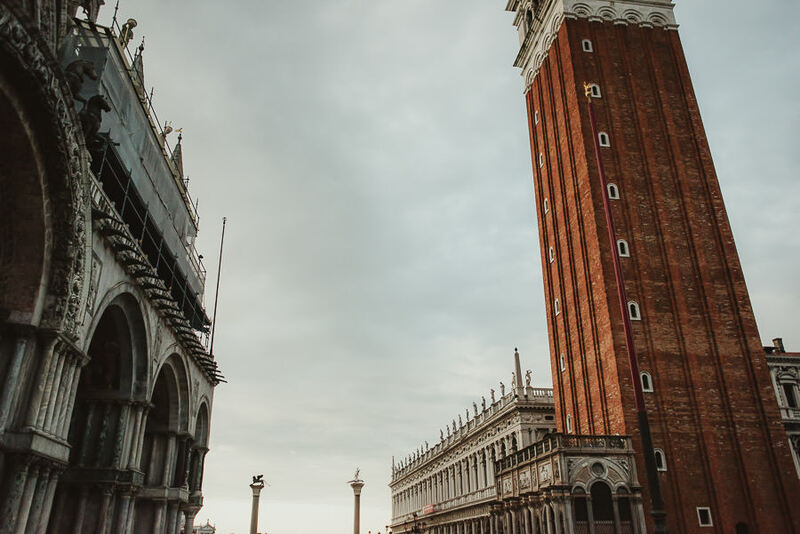 If you know Canaletto paintings, what your going to see is just the opposite! 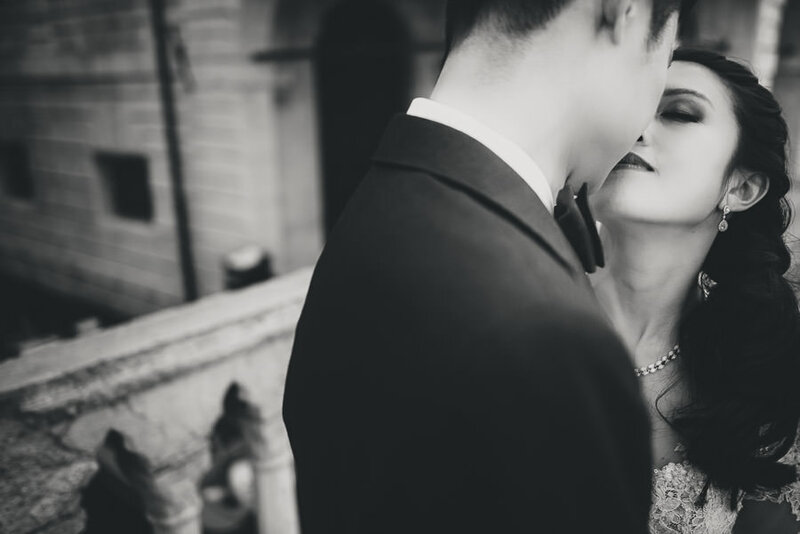 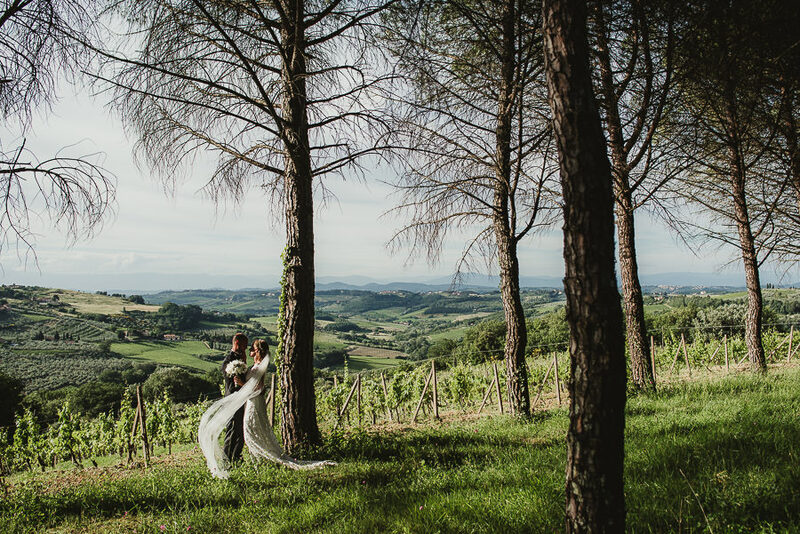 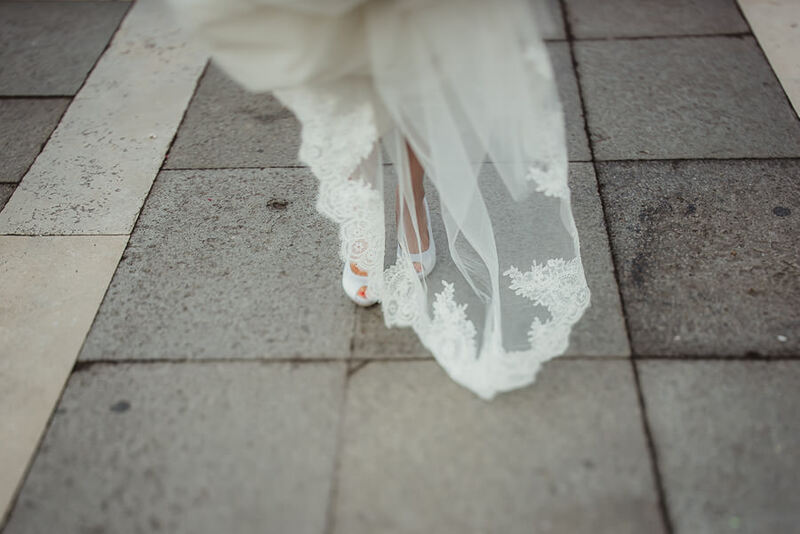 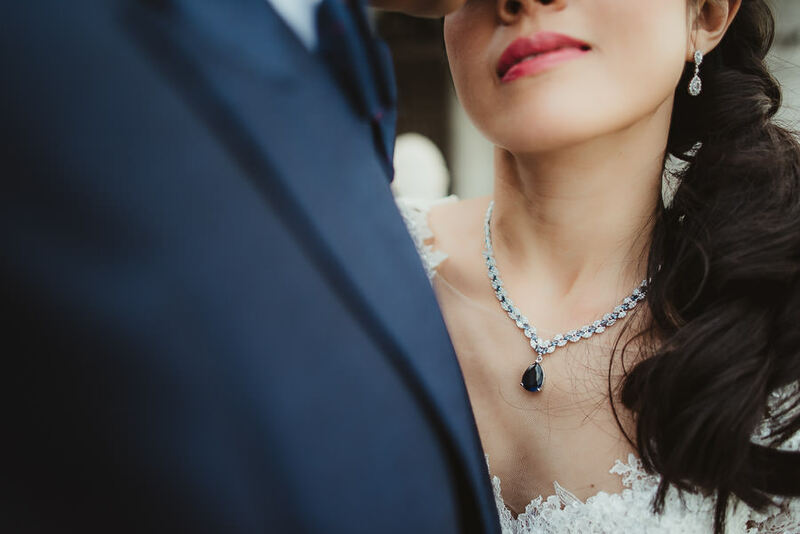 Jiaxi was wearing her beautiful wedding dress, with a huge gown and an extra long veil. 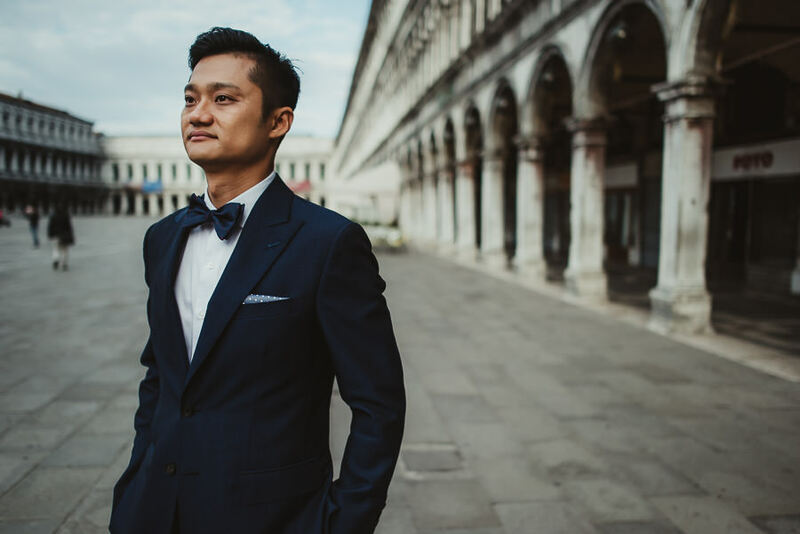 Wee wore a slim blue suit, completed by a “real” blue bow-tie. 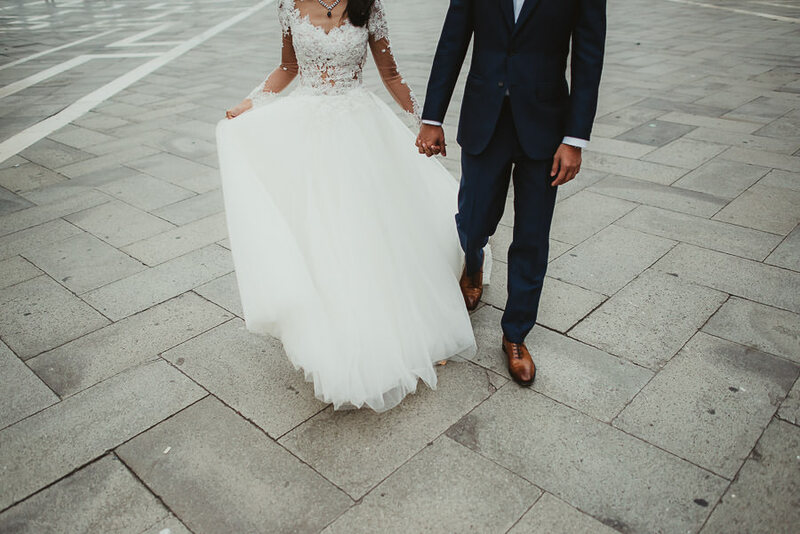 They will wear again these dresses in September in Singapore, and next time will be for their wedding! 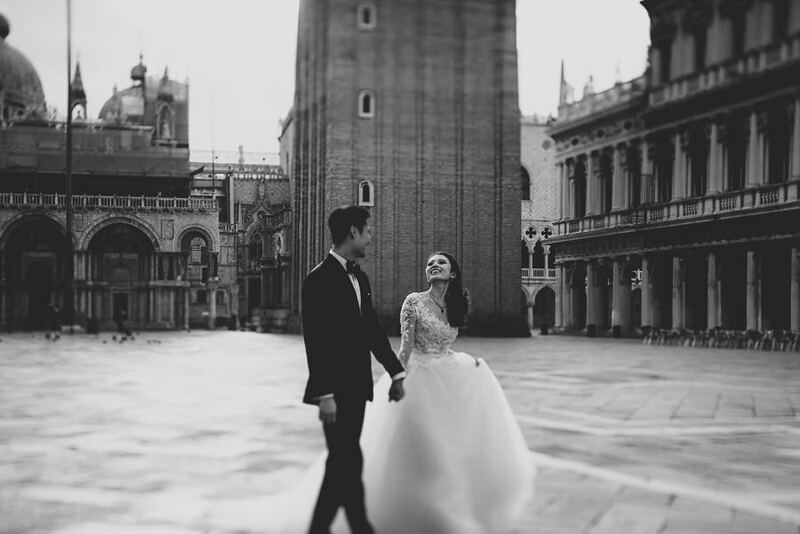 It was a blast to be there with them and I really can’t wait to come back to Venice again. 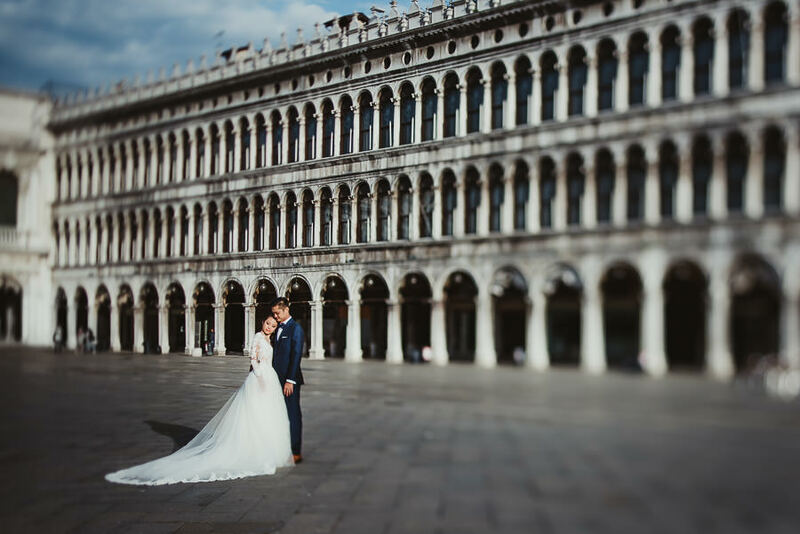 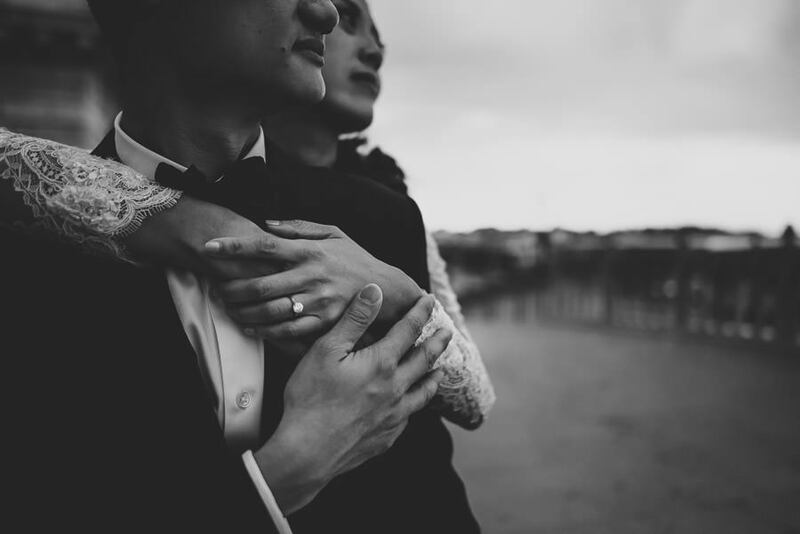 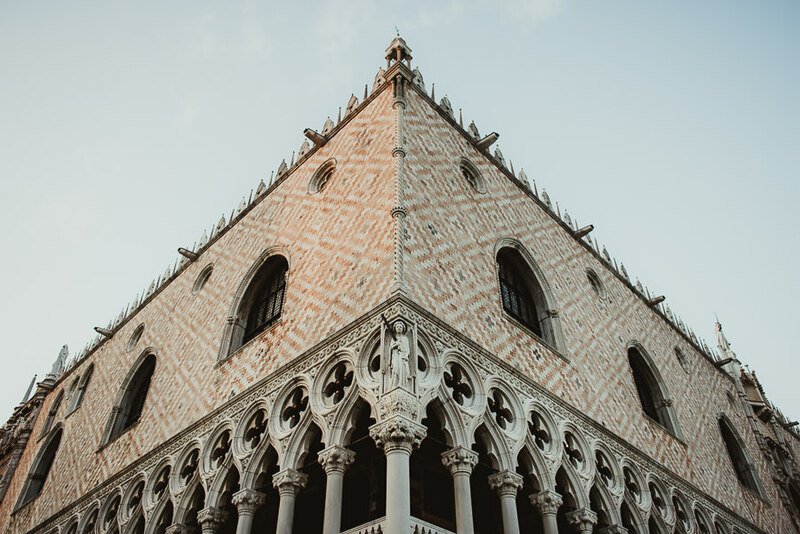 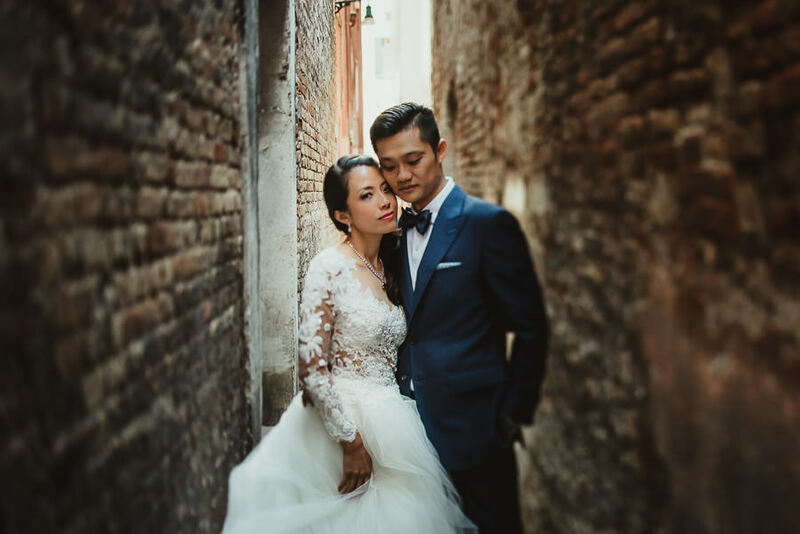 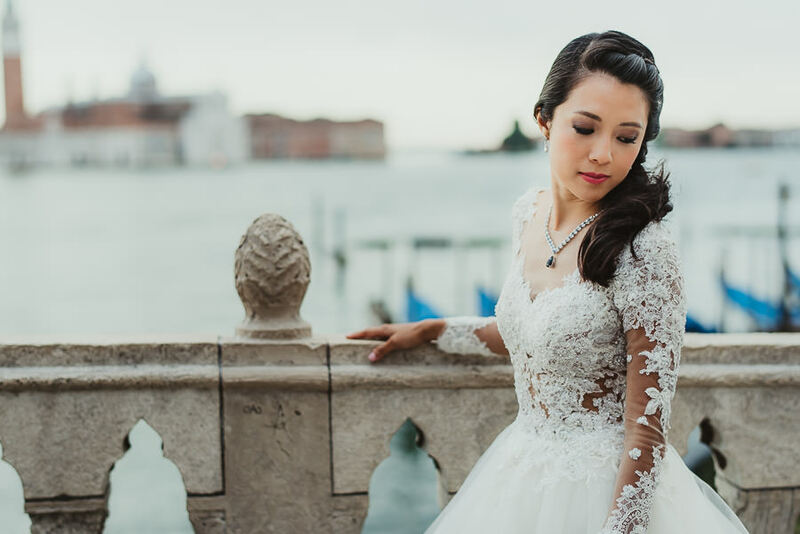 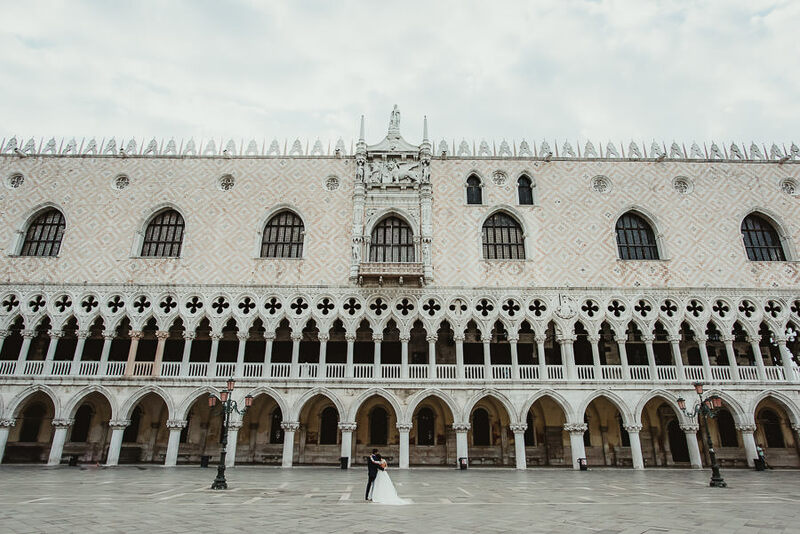 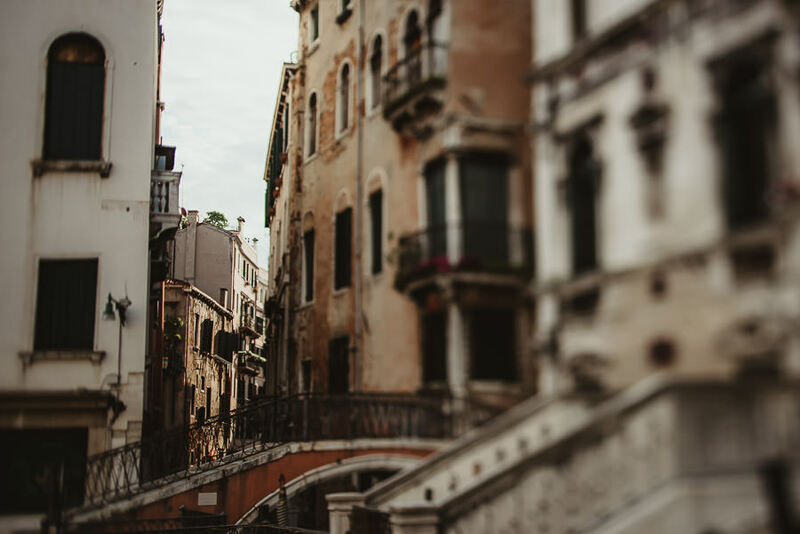 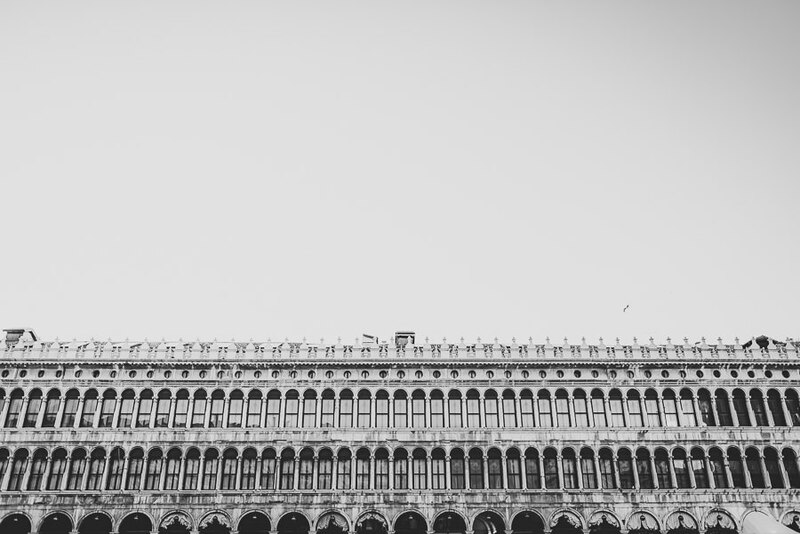 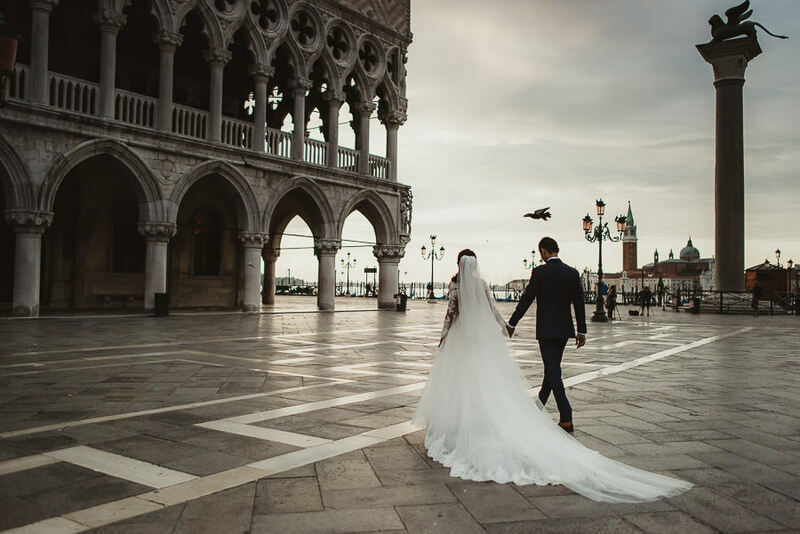 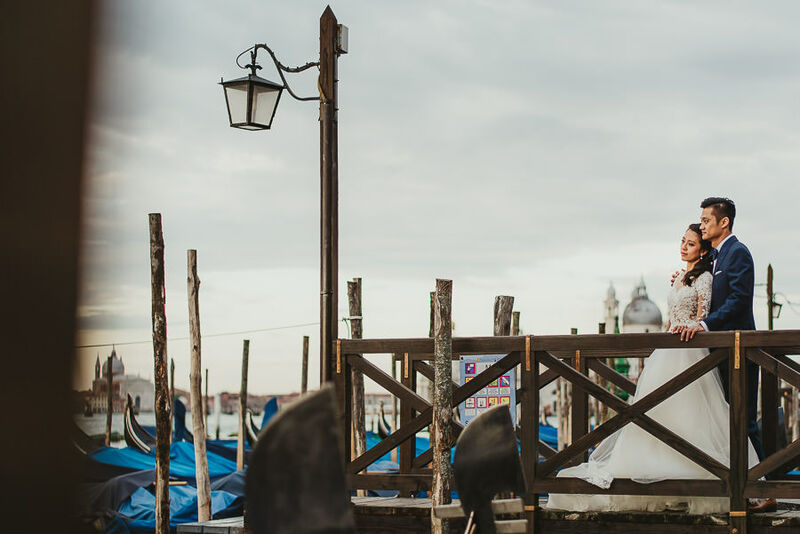 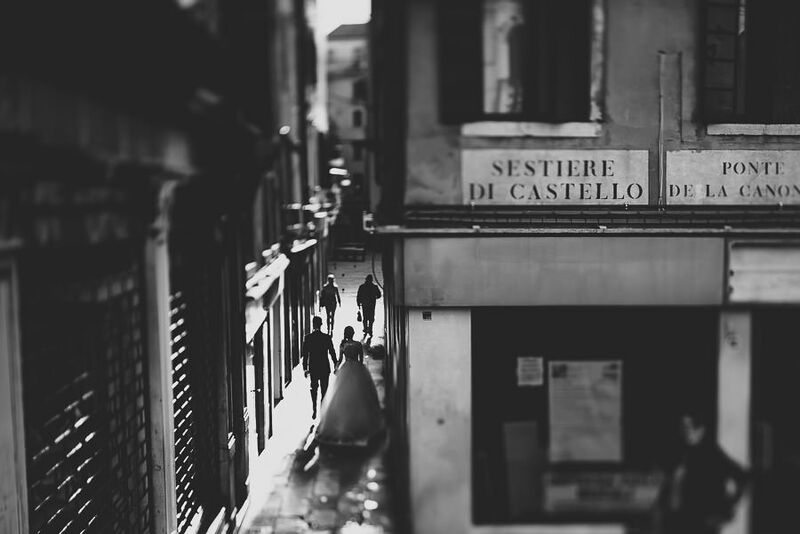 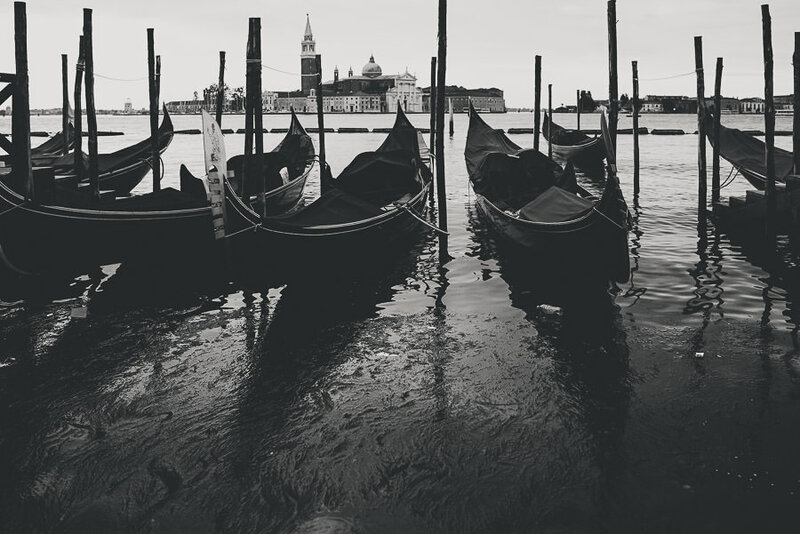 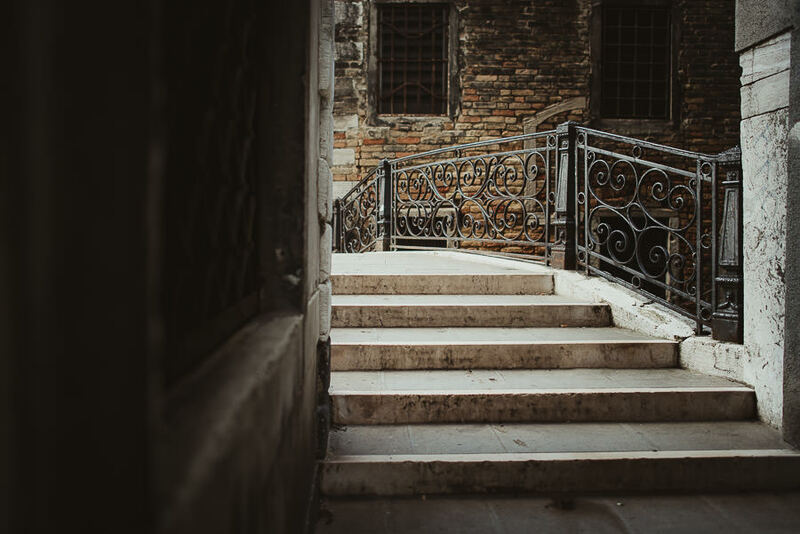 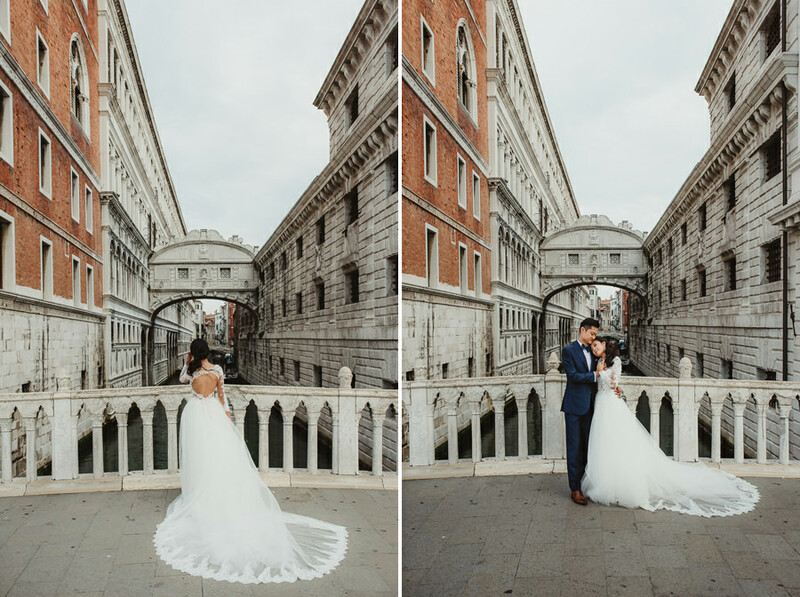 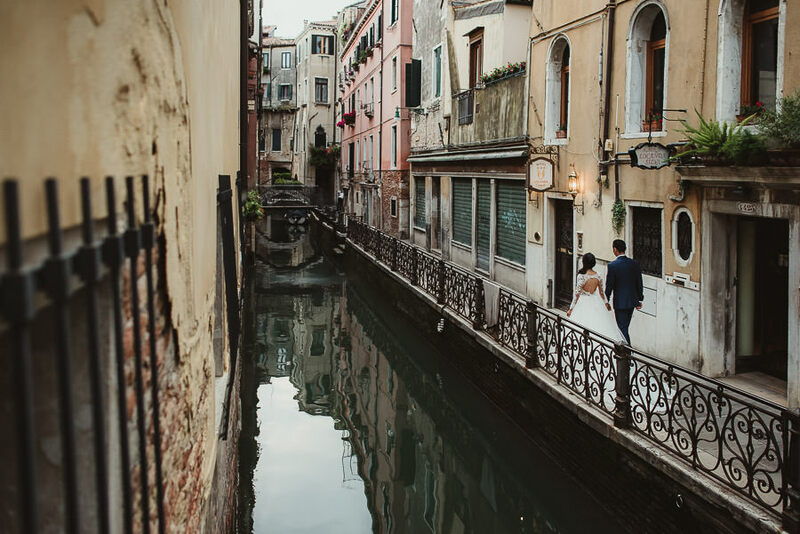 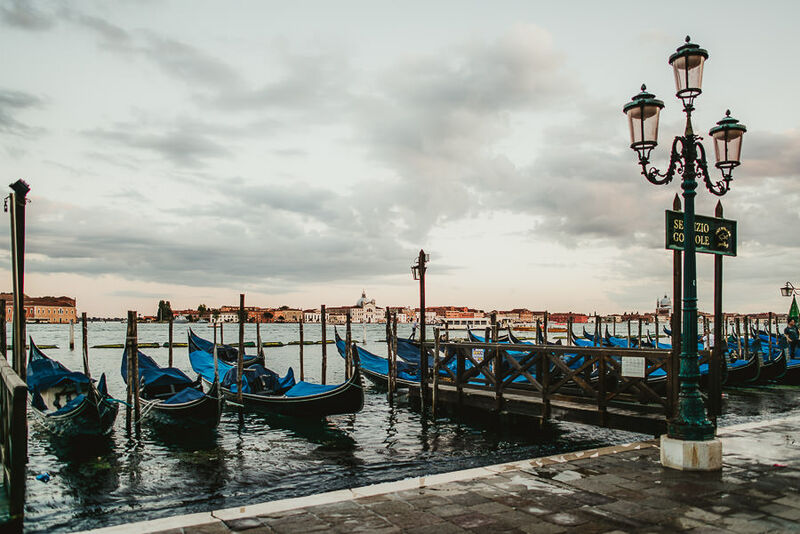 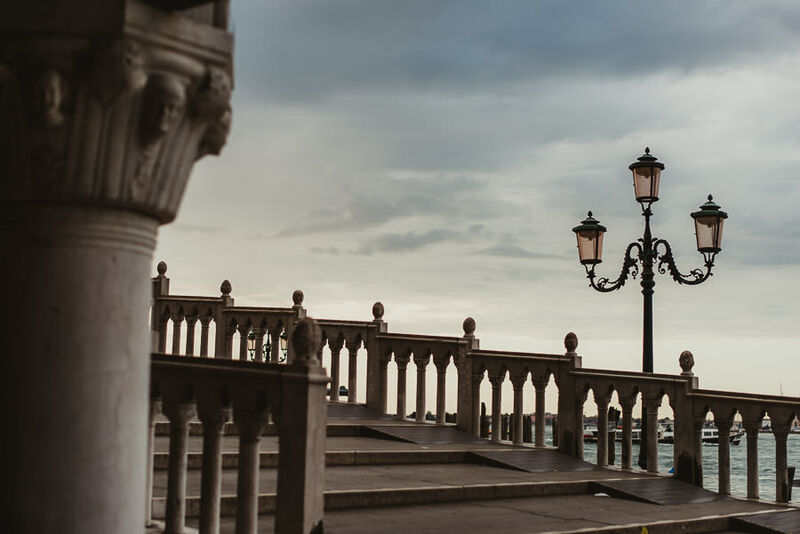 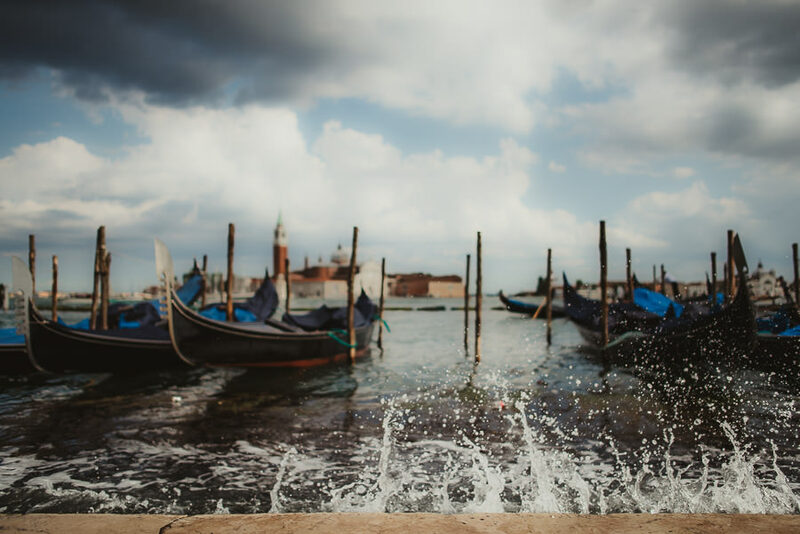 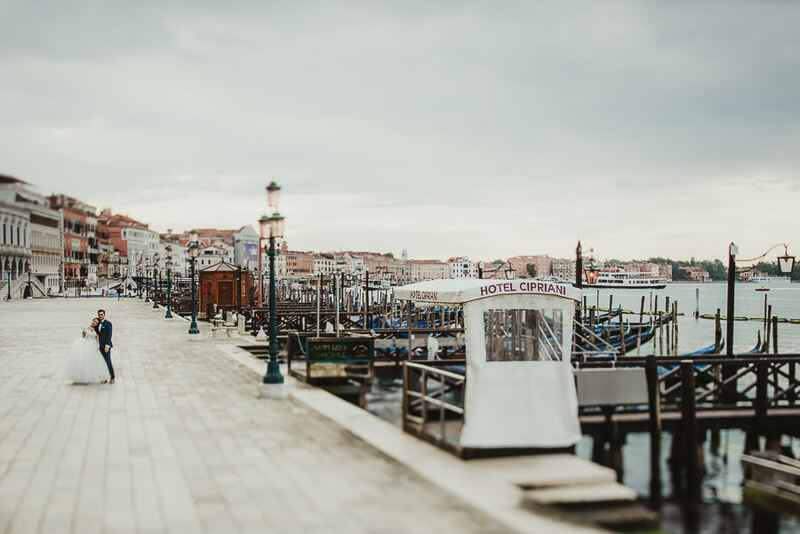 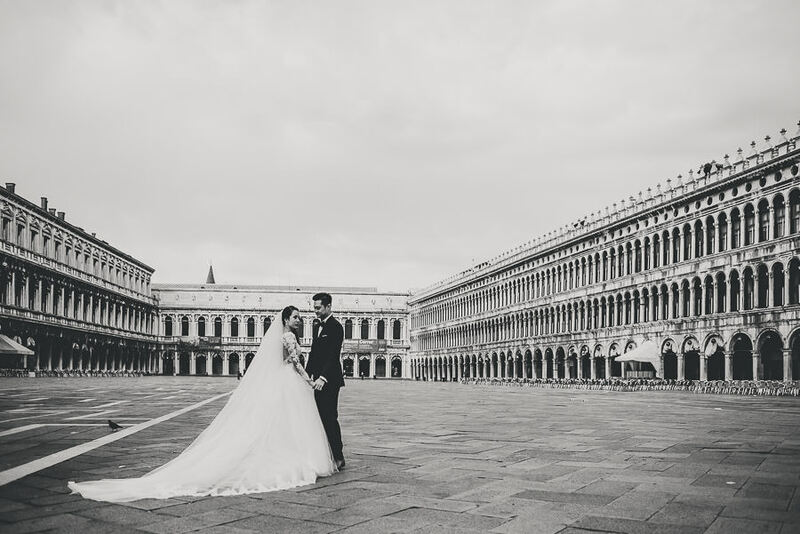 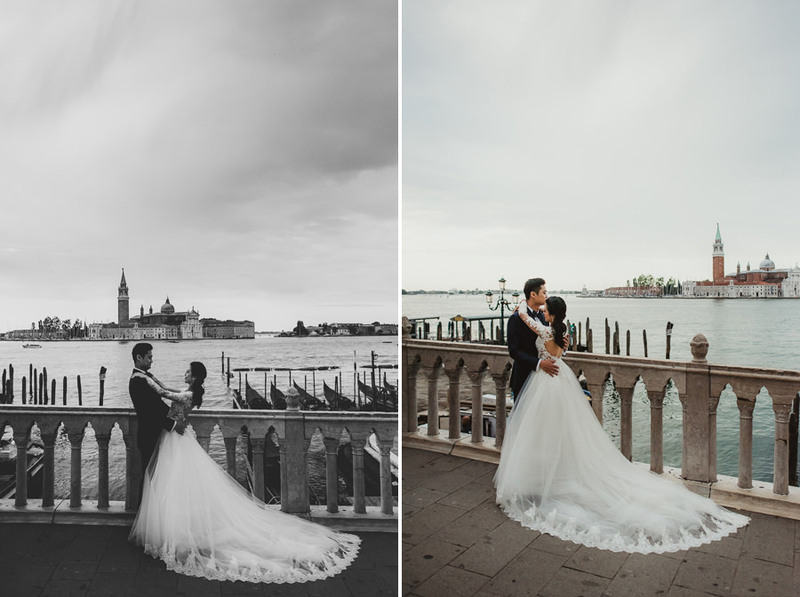 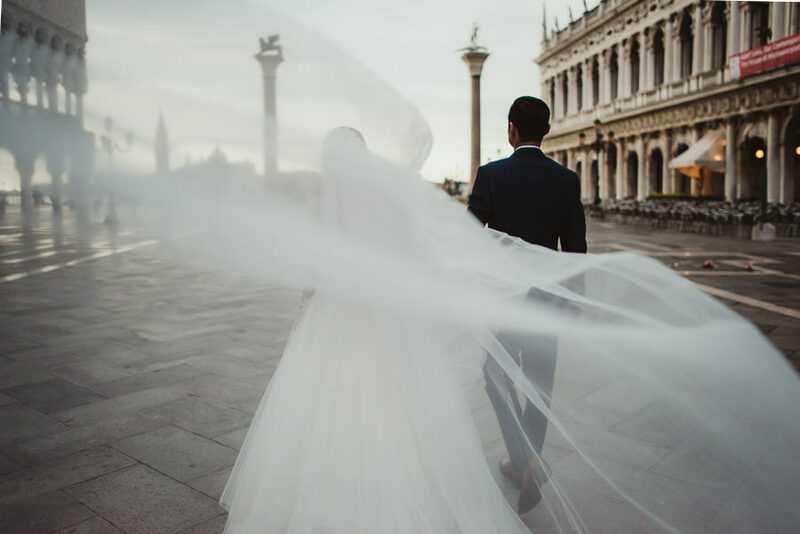 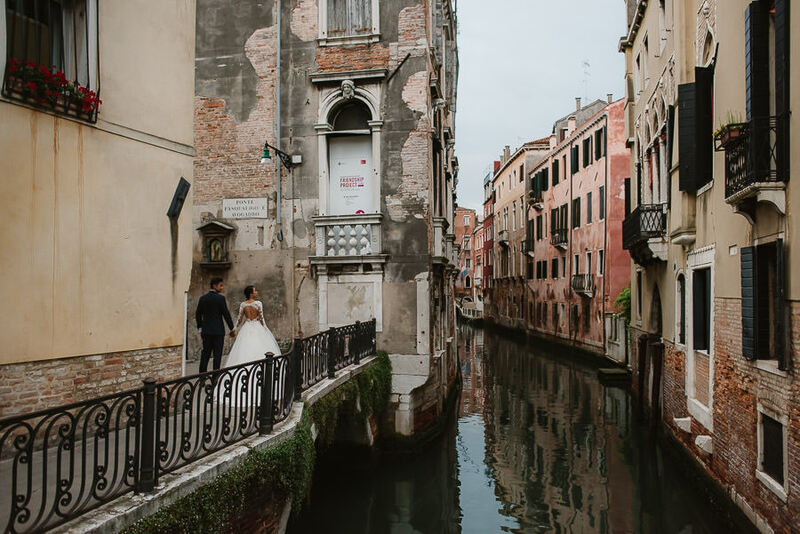 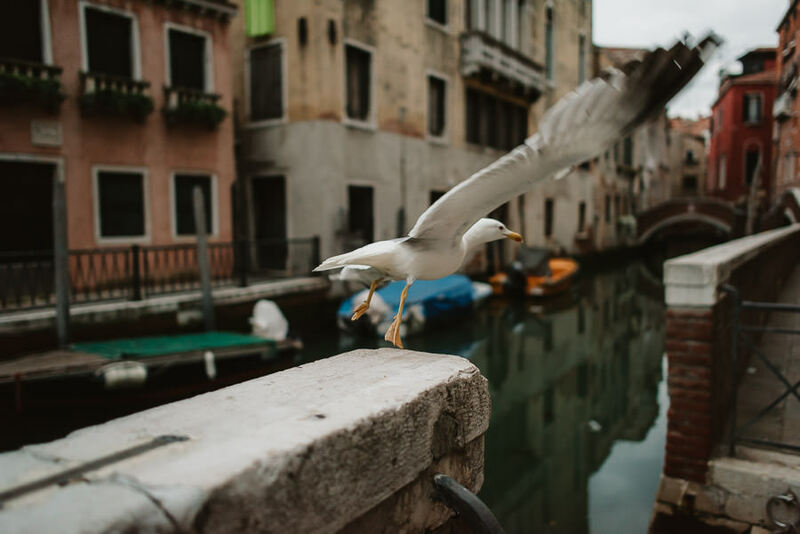 Whether it happens you’re searching for a Venice Wedding Photographer enjoy some of my favorites below and shoot me an email if you like what I did there with these two; we will surely do something great there, together! 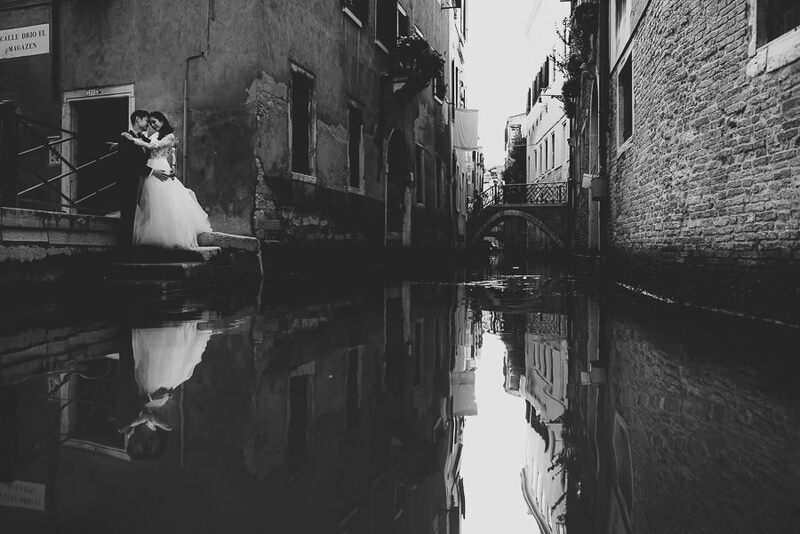 We are very interested to have a 10th wedding anniversary photo session with our 5 years old daughter by you when we are in Italy, either in Venice or Milan during the week between 20-25th August. 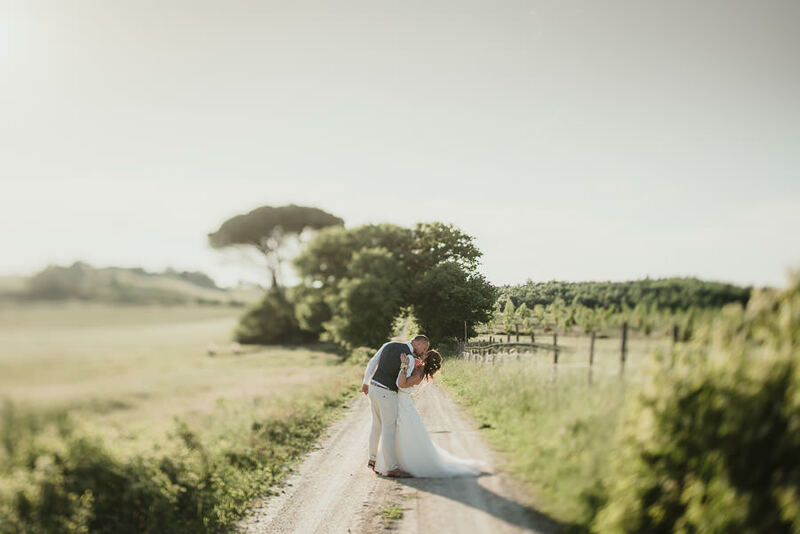 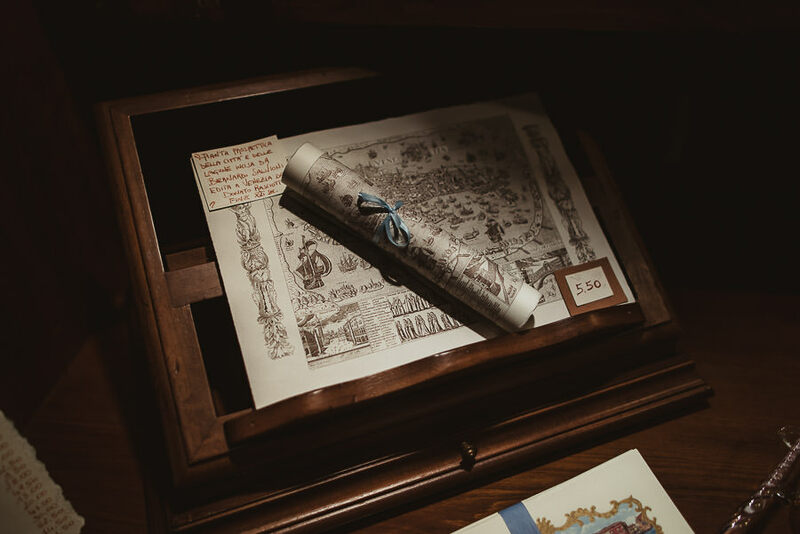 It would be wonderful if you could let us know your availability.